Suffolk County closed Long Island beaches because basking sharks were sighted. They’re big tourist draws in the UK–like manatees but with a scary name. 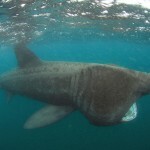 Keep reading Did Hamptons beaches close for basking sharks’ scary name? The extent of our adventure was to spend an hour snorkeling off somebody’s backyard, hovering over a single sleeping manatee, touching it as it came up for air. 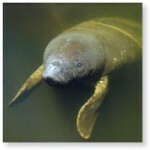 Renting a boat–even a canoe or kayak–is probably the easiest way to go see manatees in Homosassa and Crystal River. 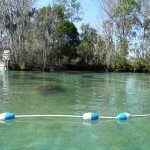 Captain Mike’s is the swim with manatee tour you want to go on in Homosassa to get close to manatees, but not bother them. 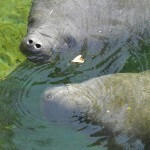 Probably the easiest and most reliable way to see manatees on the Nature Coast in northeast Florida is at the Ellie Schiller Homosassa Springs Wildlife State Park, right off the main drag, route 19. You can see female manatees that can’t leave and young manatees that will be released someday getting fed at the Manatee Care Center. 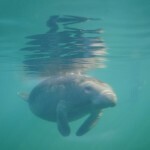 Plus, it’s one of the very few places in the area you might get to see wild manatees from the shore (easier on you and the manatees)–provided you show up in January or early February. 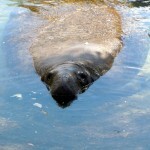 Like pretty much all the Homosassa manatee attractions, it’s hard to get your head around where the logistics. The wildlife park used to be a private zoo in Florida’s roadside zoo attraction heyday; the lone hold-over is the hippo, Lu, now 51. 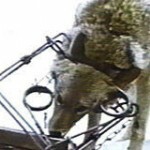 Otherwise, it now only takes native wildlife that can’t live in the wild because they were injured, sick or raised in captivity. The park has a big parking lot and outpost on route 19 but the real action is closer to the shore. You either take a pontoon boat (they leave about every 15 minutes) or you walk. Or, you can just drive there. The park really begins deep in the pretty, winding Spanish moss covered roads of old Homosassa. 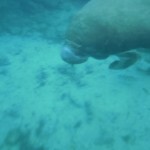 Last week I went go see Florida manatees by snorkeling, canoeing, by land, by power plant, at a rehab center. This week I’ll review the options for tourists. How does the Deepwater Horizon oil spill compare to the historical monster of Exxon Valdez, by which we judge all oil disasters? How long will this go on? We went back to the records of Valdez to look at its size and what we might lay ahead.